PLC staff joined IHAO on a delivery to the western part of Mosul. Day by day neighborhoods were being freed from ISIS control, and sights and sounds of fighting were all around. Many people were desperate to receive food after more than two years being cut off from aid. Instagram 2017.03.21: It's easy for people's humanity to get lost in the midst of news coverage and statistics. . But the people of #Mosul are more than that. . She asked for a photo, but then an airstrike hit nearby. . Then a family pulled me aside, asking for help getting food. . Then a man came along, saying he had just escaped ISIS a few minutes ago. . Then some women shouted at me, to warn that I was walking near an unexploded mortar. . Then, when I realized Id forgotten to take a picture of that girl with the emerald eyes, she was gone. . Then, I heard a small voice from somewhere behind. . Photo? . There you are! Of course." She asked for a photo, but then an airstrike hit nearby. Then a family pulled me aside, asking for help getting food. Then a man came along, saying he had just escaped ISIS a few minutes ago. Then some women shouted at me, to warn that I was walking near an unexploded mortar. Then, when I realized I’d forgotten to take a picture of that girl with the emerald eyes, she was gone. Then, I heard a small voice from somewhere behind. This is Awat, holding his beloved little Mariam. Just hours before taking this photo, baby Mariam drank the last of her formula. Her family had scrimped and saved and struggled to keep the little girl fed under ISIS rule. But as the battle for Mosul raged around them, they finally ran out of food. Then the fighting immediately around them stopped. The noise of war grew further away, and the Iraqi military secured their neighborhood. They were told they’re free now, and there is help on the way. The family climbed into trucks to join the evacuation, gently lifting little Mariam up and cradling her on that bumpy, cramped ride out of Mosul. The last we saw Awat and Mariam, she was still passed out in his arms, and they were waiting in line to receive a hot meal. “Shhhh! !” she interrupted, a rigid a finger pressed to her lips. With that settled, she went back to singing softly into her sister’s ear. 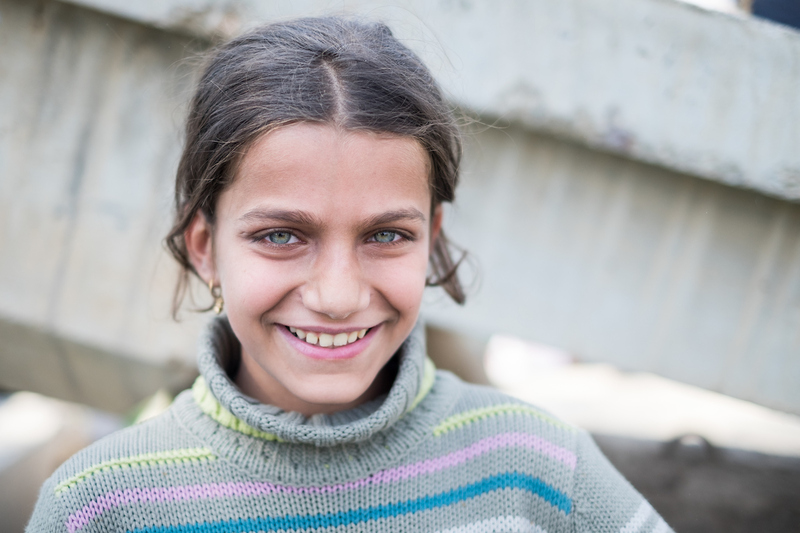 Her name is Aya, and she has loved her baby sister through hard times: mistreatment before ISIS, oppression under ISIS, bombs raining down on her neighborhood, and now severe food and water shortages post-ISIS. “Do you want a photo now?” Aya asked. Her baby sister was finally asleep. Aya’s fierce maternal face had softened now that her sister was asleep. In wartime, kids like Aya are forced to grow up too quickly. She was a child holding a child. He was out of breath, panting as he shared his story. He told us he was about to be executed by ISIS militants just moments before, but an airstrike hit the building where he was being held, killing most of the ISIS fighters around him. He managed to escape in the chaos. After sharing his story with us, he asked if we could help him get food. We explained we couldn’t cut in on the system, which is designed to make sure food is distributed as fairly as possible. He needed to wait in line and have his registration papers stamped like everyone else. A little later, he came back to us. His family had already received food, he told us, and he was thankful to you for showing up in their time of greatest need. When her father walked away from our trucks with food slung over his shoulder, Sidra’s brothers and sister cheered: “He got it! He got it!” Food, after weeks of almost nothing to eat. You made her daddy a hero that day, but he was a hero long before we showed up. He had held his children close through the bombs and bullets, and he nursed Sidra after she was burned on her neck and face. Sidra leaned toward her daddy at every boom and gunshot. The war was only streets away. The family huddled there, looking tired but resolved. It was clear they had endured together. Their faces, the way they looked at each other and held one another—these are people who’ve known horror but survived it as a family, by being a family. To us, he is still a big man. The biggest. In sickness and in health. Through terror and war. A father who loves his wife and children. Help us reach more families like these who are still trapped in West Mosul.